Diana Stein and I will be sharing a booth again this year in the Fantasy Illustrator section of the Exhibit Hall. I look forward to all the excitement of the Comic Con with not a little dread! But, hey, it's FUN. Insane, but fun. I got a bunch of dolls in this year. This little guy was almost an after-thought. I saw one at a meetup and just thought he was too cute to pass up. He's a Tiny-sized, about 12" tall. From 5StarDolls, one of the newer companies based in China. 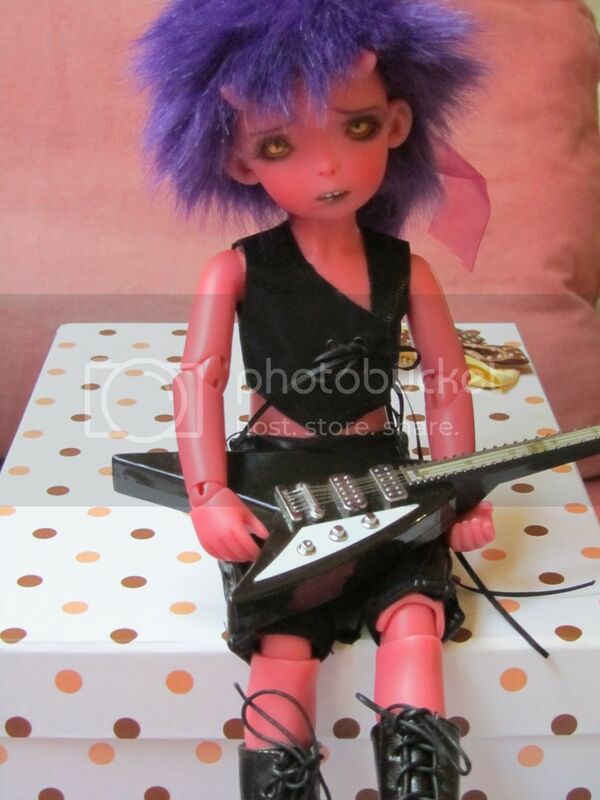 He reminded me a bit of Soom's red Trond, a little demon guy that tempted me. And also a bit of a chibi-Hellboy. And his price wasn't too horrible. His red color is limited to 100. I'm calling him "Nik the Imp." He's wearing clothes by PixieDust. Art: IMC-- Last bit--other students work, etc. The students are seriously amazing (even the ones who are just starting out, since all levels are able to come). There are Art Directors who are doing the class, as well as working artists and hobbyists and people who are doing something else but want to get into art, and art students. And there have already been success stories--students who have furthered their careers and who are getting into Spectrum and getting jobs. There are students who have started their own art workshops. And those who are just happy to hang out in an artistic atmosphere for a week. 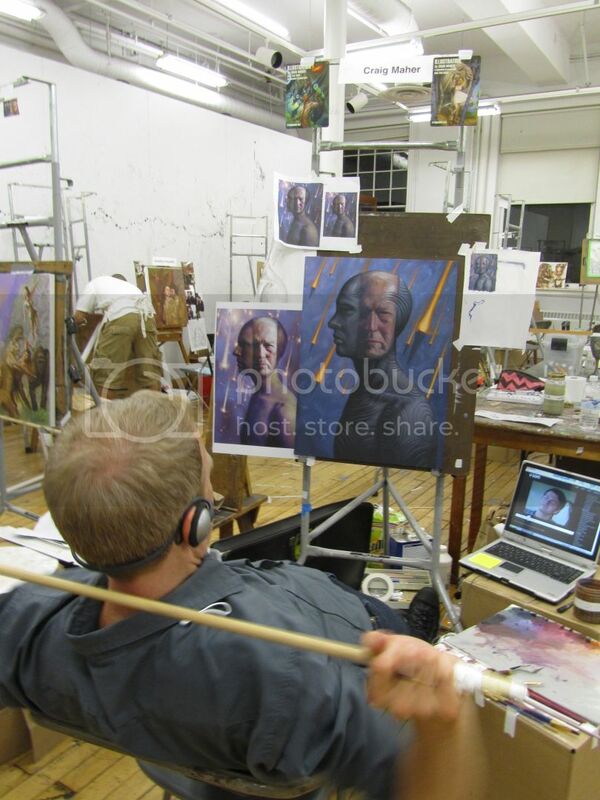 For the IMC (Illustration Master Class), there are always cool choices for the assignment. This year there was the High Fantasy: "Tristan and Isolde", the SF: "Old Man's War by Scalzi, movie tie-ins: "Tarzan" and "The Hunger Games", and a YA short story about a boy and a ghost. I've always chosen the fantasy assignment. At this stage of my life, I'm more interested in doing things for myself and I prefer to concentrate on fantasy images. Although Tarzan was tempting. But I liked the costumes and romance of "Tristan and Isolde." 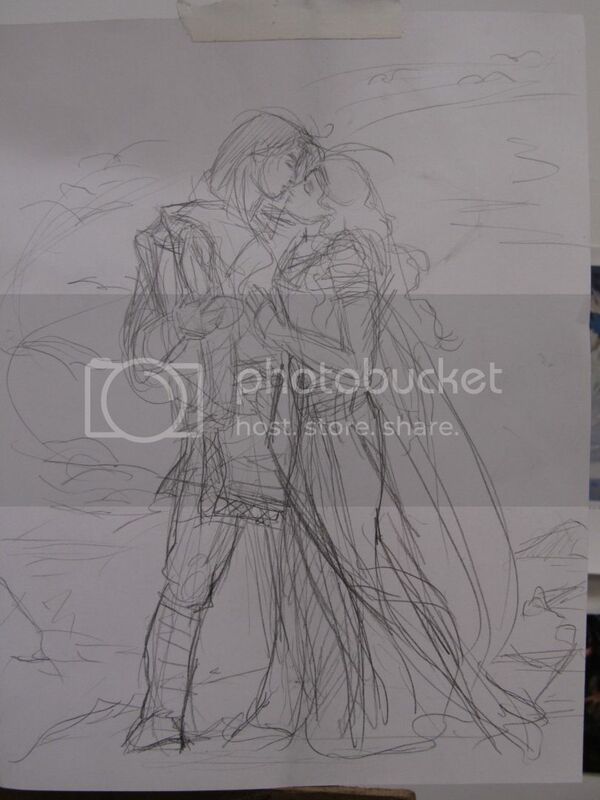 I worked up several sketches--all sadly pretty similar, of a couple, full-figures. I'm afraid I had a pretty set idea of what I wanted, the poses just varied slightly. I didn't do thumbnails (bad me), and I didn't draw boxes around the sketches (I use the page size as the box (again, bad me). Well, I'm back from the IMC (Illustration Master Class). I've been bad about posting the past few years, so I'll try and be better this time around. As usual, I have not broken out the paints to finish up my painting... but that doesn't mean I won't. I can definitely see where I'm going with it. I just need to set up a painting space--something that hasn't happened yet, but I'm still hopeful! 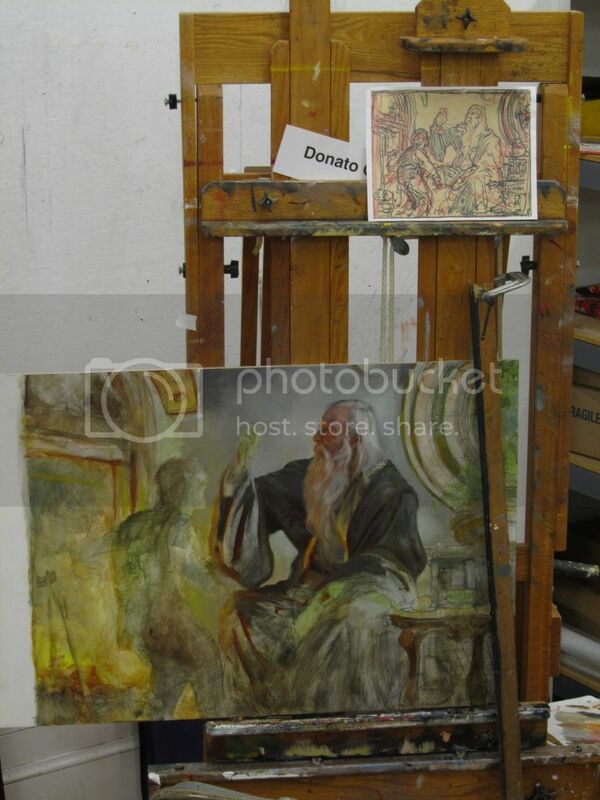 Donato's set-up, working on a painting of Gandalf. Still at the IMC. I chose the "Tristan and Isolde" assignment. Going for the Romance! I'm in Amherst, MA for an awesome week of the Illustration Master Class. This will be my fourth year. About to get crits from Ian McCaig, Rebecca Guay, Greg Manchess and Dan DosSantos... They are the most fun crits ever, if you can believe it. Took a while to 'evolve,' but finally...!